Join the Plano Symphony Orchestra for great movie music! 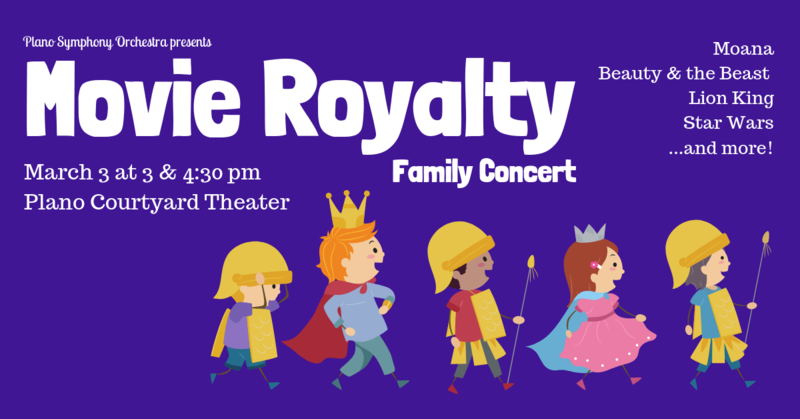 Ensembles will perform selections from Moana, Star Wars, Lion King, Beauty and the Beast, Aladdin and more. Kids are invited to attend dressed like favorite movie characters! These beloved films will be brought to life by actors from North Texas Performing Arts and dancers from the Ballet Ensemble of Texas and the Acting Studio of Texas. Come early to enjoy lobby activities such as the Instrument Petting Zoo and craft station. A music STEAM patch is available for an additional $2 from 2-3pm. Kids will learn about the physics of sound through science experiments based on musical instruments!